iManage Performance is currently delivering a blended programme to East Sussex County Council. The programme called Managing Agile Workers, forms part of their ambitious move towards complete agile working across the organisation over the next few years. Moving to an agile environment is a large logistical and emotive change for many requiring a change of mindset. It is a challenge for both managers and team workers alike. Managers face the prospect of not seeing their team members as much and not having the same level of responsiveness and communication as when the team works together in one space. 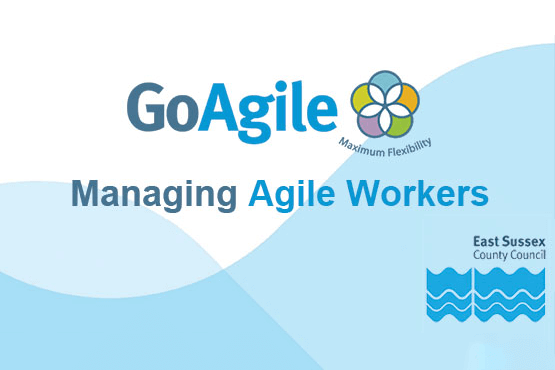 Over 500 managers at East Sussex Council and their teams are moving to agile working. Some will embrace this change and may already work in an agile way. For others resistant to change, there are many aspects to be worked through. Managers are concerned that productivity will fall and motivation will be affected. Interdepartmental dependencies will be affected and response times and customer care may be adversely impacted. The way that employees can communicate with their managers will change as will the way that managers delegate and control workflow. Working in an agile way implies homeworking but it can mean working anywhere remotely at any time including hot-desking. This in turn creates potential issues as some people who are motivated by being physically around a team and having their own space may find it hard to adapt to such a new way of working. The challenge of the programme was to explore these different dimensions of managing an agile team in terms of transition, motivation and productivity. iManage wrote the content which was designed to augment the work that the transition team were doing with the rollout of technology and processes. The blended programme that we designed explores the performance management aspects of this move from a managers perspective. The content includes the role of trust and how this is heightened when moving towards an agile team and how motivation can be both negatively and positively changed by such a move. It includes practical tips for managers all underpinned by proven learning science. As in all of our blended programmes, the different touchpoints, in this case the workbooks and e-learning, were all designed to have consistency in terms of look and feel and tone of voice. This made it familiar to the attendees and easier for them to relate to the content. Over 500 managers will be taking the face to face training over the coming months. Many hundreds more co-workers are being encouraged to take the e-learning course which has been developed specifically. There are e-learning modules for managers that build on some of the themes introduced in the classroom sessions. The other modules are designed for team members and focuses on maintain a work life balance when working agile. All of the e-learning was developed SCORM compliant and sits on the East Sussex County Council LMS. The programme is ongoing and will continue until mid to late 2016. Some of the course content has already been adopted successfully by certain departments. Some of the tools that iManage suggested have are now featured on the East Sussex County Council’s staff intranet and are being utilised. The classroom sessions have been attended by both senior managers and middle managers with very positive feedback. The e-learning has been positively received by both managers and team members.